Vedantu.com - No.1 online tutoring company in India provides you the Free PDF download of NCERT Solutions for Class 6 Science Chapter 6 - Changes around Us solved by Expert Teachers as per NCERT (CBSE) Book guidelines. All Chapter 6 - Changes around Us Exercise Questions with Solutions to help you to revise complete Syllabus and Score More marks. Register for our free webinar class with best Science tutor in India. Change is the only constant. NCERT Grade 6 Science Chapter 6, Changes Around Us deals with the changes that happen in the surrounding, their types and effects. 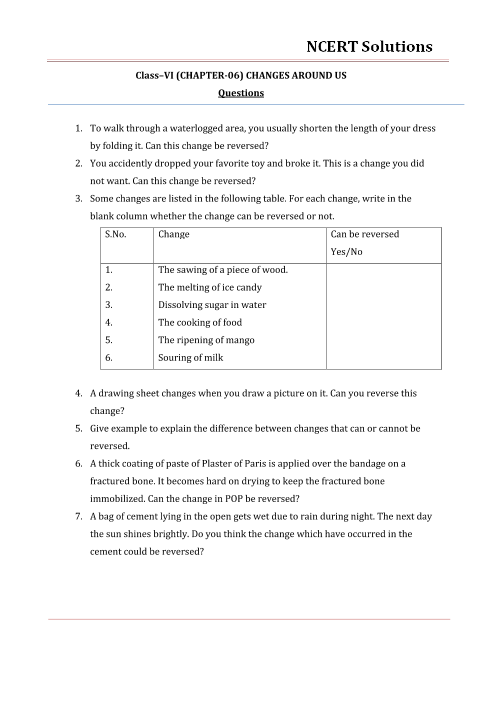 It also helps the students to learn to group the changes together based on their similarities.The chapter begins by demonstrating different activities that help the students to classify changes as reversible or irreversible. These activities are simple but add to the learning experience of the students. NCERT Grade 6 Science Chapter 6, Changes Around Us further plunges into the concept of bringing about a change using external forces such as pressure and temperature.Simple language, lots of activities, exercises and daily life examples make the learning experience fun-filled and helps for longer retention. Introduction to new concepts, new technical terms, Project work and demonstrations, make this chapter very creative and colourful. Students get accustomed to new terms and phenomena that shall help them in the future to deal with complex concepts associated to change in the surrounding and its effects. Grouping of changes based on their similarities helps to learn better and develop a grip on the topic. Get 100 percent accurate NCERT Solutions for Class 6 Science Chapter 6 (Changes around Us) explained by expert Science teachers. We provide solutions for the questions given in Class 6 Science textbook as per CBSE Board guidelines from the latest NCERT book for Class 6 Science. The topics and sub-topics in Chapter 6 Changes around Us are given below. Ex 6.1 - CAN ALL CHANGES ALWAYS BE REVERSED? Ex 6.2 - COULD THERE BE OTHER WAYS TO BRING A CHANGE?. Chapter 6 - 7 Questions with Solutions. Other than given exercises, you should also practice all the solved examples given in the book to clear your concepts on Changes Around Us. Download the free PDF of Chapter 6 Changes around Us and take the print out to keep it handy for your exam preparation.